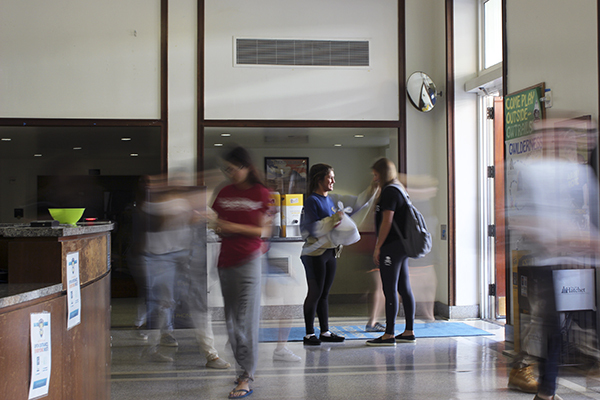 Officials are considering ways to upgrade Thurston Hall, where students have complained about bathroom mold, slow elevators and dirty carpets. Students have said it for years, and officials now agree: The University’s oldest residence hall is due for a makeover. Thurston Hall has stood on the corner of 19th and F streets for 86 years. As officials, the Residence Hall Association and other student leaders explore options to renovate it, current residents cited slow elevators, crusty carpets, moldy bathrooms and other relatively minute issues, highlighting the disconnect between what freshmen want and the total overhaul some leaders say is necessary. University spokesman Kurtis Hiatt confirmed that officials would look into its options for upgrading the hall last month. Nearly two years ago, the University committed to renovating upperclassmen residence halls every seven years after a string of complaints from students, though there is no timeline for the Thurston renovations. “We do not yet have any details on potential renovations or a timeline for them. We encourage students to provide input,” he said. Hiatt said the fixes could be “minor or more extensive renovations.” He said the Board of Trustees approved funds for the initial examination process in May and declined to say how much the University plans to spend to upgrade Thurston Hall. RHA President Mike Massaroli said overhauling Thurston Hall is a challenge because not only do about 1,100 students live there during the school year, but it also houses new students during summer Colonial Inauguration sessions. Massaroli said University officials are “very much allies on this,” and he said small upgrades to residence halls ‒ like new toilets and furniture in International House, where he’s lived for three years ‒ as well as new showers in Shenkman Hall, which were installed in the last year, do make a difference. “[Administrators] are like, ‘We’re fixing Thurston. We’re going to be doing a big overhaul in a few years so we don’t really need to look at Thurston right now and fix it,’” said Blake Reinken, the President of the Thurston Hall Council. Reinken said students are more concerned with repairs that could impact their daily lives, like unreliable elevators and doors not closing, rather than major upgrades. “That being said, people don’t regret the decision to live in Thurston. You kind of know what you’re signing up for. I think a lot of people here would not trade the social benefits and the friendships and relationships they get from Thurston for the comfort of Potomac, ever,” said Reinken. Harrison Grauso, a sophomore and the former Thurston Hall Council president, ran for the position on a platform that included building a communal kitchen in the residence hall, which opened this year. He said the kitchen construction was an example of the University responding to the needs of students in the residence hall. “Because it houses the bulk of the freshman class, most students’ first experience at GW is Thurston Hall, so it should definitely represent what GW wants to portray and its respect and admiration for the student body, and I definitely think that it could be improved,” Grauso said. But as far as long-term renovations, several current residents cited the bathrooms as the problem area – complaining of mold – though Hiatt said the University has no confirmed reports of asbestos. “The whole bathroom needs to go. I’d say focus on the bathrooms before the actual rooms because those can wait,” resident Dania Assas said. He noted mold, plumbing, clogged drains and a door that wouldn’t close all as problems she’s faced in her room her first month living there. Other residents weren’t as concerned with the condition of their living space. Madeline Sklar and Danielle Zukoff contributed reporting.